Hidden down an unassuming lane-way on Spadina Avenue, in an unspectacular coach house, is the bike repair shop/underground cinema/event venue, CineCycle. It may not look like much from the outside, but CineCycle is home to an impressive collection of films and, as its name suggests, is also the go-to spot to fix a bike. By day, CineCycle owner Martin Heath, a cyclist and bike enthusiast, says he does the repairs "that other people find impossible." In the evenings and on the weekends, Heath clears the bicycles from the shop and rents out the coach house for film screenings, live performances and special events. 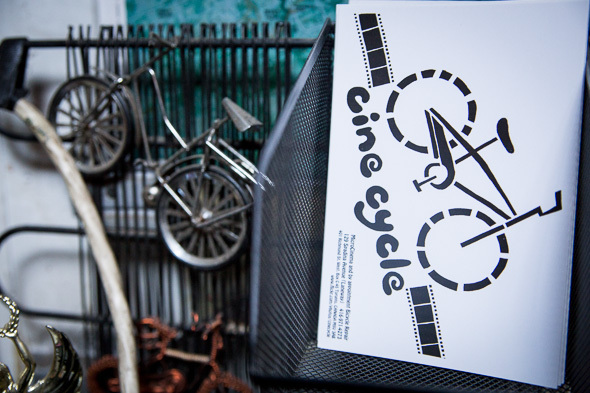 CineCycle's walls are adorned with bicycle art, film posters and articles about the venue (and its predecessors - Heath has been fixing bikes and screening films for decades in various locations around the city). A large 9 by 12 foot projection screen hangs from the ceiling at one end of the room, with row upon row of film reel canisters stacked below. One need only read CineCycle's schedule to get an idea of why this venue stands out within Toronto's sardined film scene. For example, CineCycle will host a 16mm loop "film projection performance" with live music on Friday, August 30, and a curated film screening hosted by the Process Reversal Collective on September 3rd - all events are open to the public. 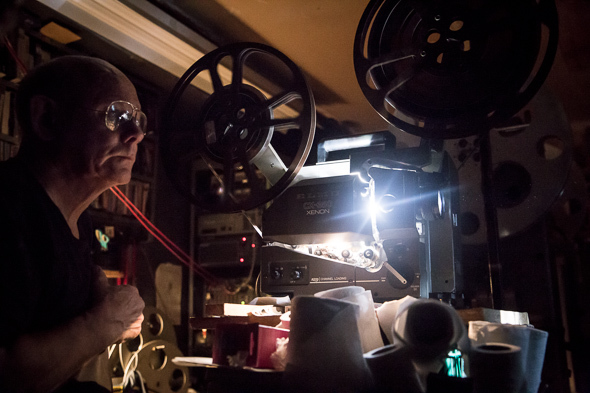 One Sunday a month, Heath also screens a film from his personal collection of "probably about 500 films" - a collection he's grown, in part, by rescuing reels from the garbage. 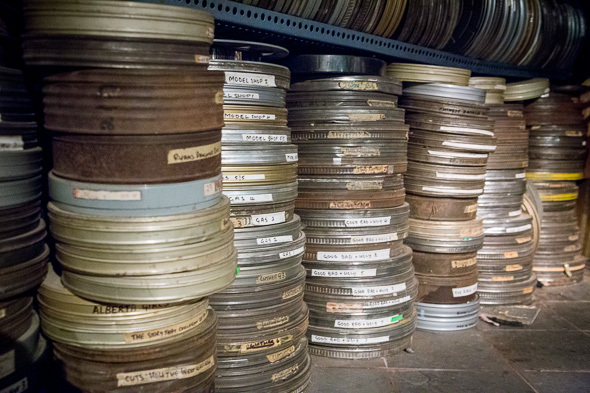 "A storage facility was moving and they abandoned a lot of films," he explains. "I was able to salvage them." The films he reclaimed are mostly of the Hollywood variety - like the 1974 sci-fi/fantasy Zardoz, starring Sean Connery (look it up) - but Heath also has a significant number of silent films and rare finds like his collection of Scopitones. The films, the bikes and especially Heath himself (the man offers a wealth of knowledge on films, projectors, festivals and, of course, bicycles) are three great reasons to check this place out. If you're in the mood for a completely unique experience, ride your bike over to CineCycle. 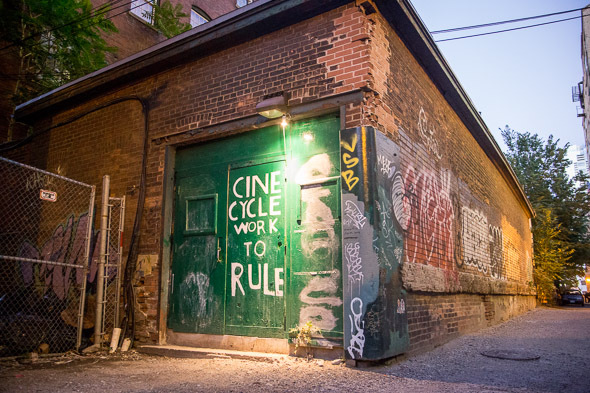 CineCycle is located in the lane behind 129 Spadina Ave. You can learn more about the cinema and book your bike repair via their web site.